The total property tax take in England and Wales in the year to March 2015 surged by £1.5 billion due to stamp duty land tax alone, according to figures from Lloyds Bank. In a report from the financial services provider, Lloyds points to a two-tier effect of improving transaction levels in the property market as a whole, and rising house prices. Combining the two together added a hefty £1.5 billion to the total amount paid by buyers on this property tax alone. In 1999, only a third of first-time buyers paid any stamp duty at all, with the remainder buying properties below the lowest threshold of the tax. Now, according to Lloyds, more than two thirds face paying the property tax while purchasing their first home. 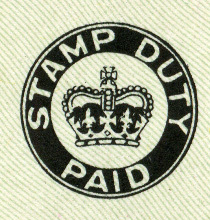 For the year to March 2015, the total amount raised in stamp duty was £7.7 billion, even higher than the £6.2 billion raised in the year to March 2008, when the previous housing boom peaked. Lloyds housing economist Nitesh Patel said: “The average homebuyer now pays almost £10,000 during their life as they make their way up the housing ladder. “The welcome reforms to stamp duty announced by the chancellor last December have helped to reduce stamp duty bills for the overwhelming majority of homebuyers and movers.